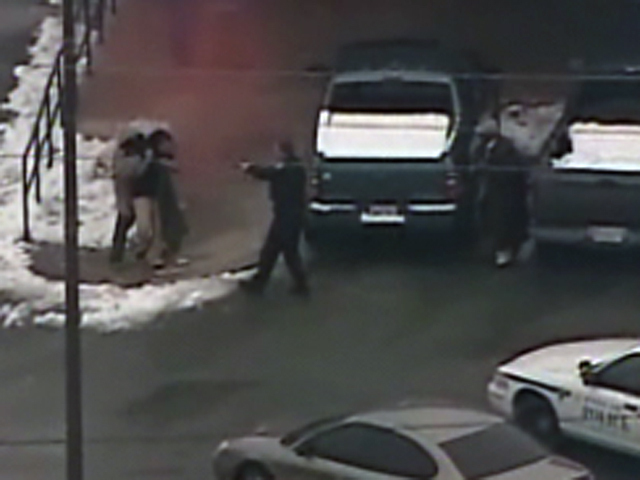 (CBS/AP) Dramatic video shows an alleged bank robber being shot by police after slipping and falling on ice. The incident happened at the Capital One Bank in Takoma Park, Md. around 9:00 a.m. on Friday. Police had the bank surrounded when the alleged robber came out of the front door with what looked like a gun to the head of a female hostage. As the robber made his way from the bank with the hostage he appeared to slip on ice that covered the parking lot after this week's snow storm. Police immediately moved in and fired shots at the man. The suspect's condition is not immediately known. The hostage escaped uninjured.